The electoral turnout of Arab citizens of Israel is expected to suffer an unprecedented slump in the upcoming April 9 elections for the Knesset. While Arab voter turnout reached 63.5% when Israel’s last general elections were held in 2015, it is expected to decline to just 51% this time, closely approximating the historical average turnout prior to the establishment of the Joint List. These were among the findings of a survey that maps Arab voting intentions and patterns that were presented before participants in an academic conference held on Thursday, March 28, at Tel Aviv University. 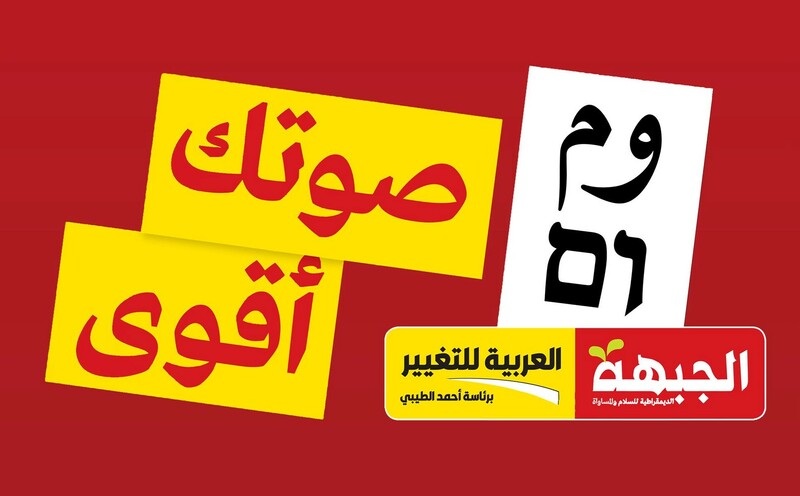 An Arabic-language electoral campaign promotion by the Hadash-Ta’al alliance; to the left “Your vote… is stronger”; to the right, the two-letter ballot emblem for the alliance in Arabic an Hebrew, beneath which are the logos of two allied parties, Hadash to the right and Ta’al to the left. Whereas 82% of the Arab vote four years ago was cast for the Joint List (or more than 52% of all potential Arab voters), among those Arab citizens intending to vote on April 9, the former Joint List parties, now split into two blocs, are expected to receive only 63% of the Arab vote (or only 32% of the Arab voting-age population in Israel). From these numbers, the Hadash-Ta’al alliance is predicted to receive some 40% of the vote (only about 13% of the eligible Arab voters) while Ra’am-Balad is almost evenly pitted with 40%. Of those Arab citizens who claimed they do intend to vote, almost 10% said that they were still undecided about their choice when they were questioned. Or, in other words, the survey found that of the total 51% of eligible Arab voters who said they will be voting, 26% claim they will be casting their ballot for former Joint List parties (either Hadash-Ta’al or Ra’am-Balad) and another 10% are still undecided, for a total of 36%. The survey revealed that from the remaining 15% of eligible Arab voters who intend to participate in the elections, the two Zionist parties set to benefit most from the their votes are Meretz (10% of those voting, or about 5% of those eligible to vote) and the Blue and White Party (9% of those voting, or approximately 4.5% of the total voting age Arab population). The latter party assembled by, among others, three former heads of the Israeli military is expected to receive some 57% of the Arab-Druze electorate’s backing. (The Druze community makes up approximately 9% of the overall Arab population in Israel, but is exceptional and prominent in its historical recording of serving in the armed forces.) The Labor Party and Likud are expected to receive limited support from the Arab community, 3% and 2% respectively, or 1.5% and 1% of the eligible Arab voters. Among the 49% of eligible voters who told the survey that do not intend to vote, half (some 50%) said it is because they have “no interest in politics”; 19% said no party represents them; and 12% said they would not be voting following the breakup of the Joint List. Only 10% (or 5% of eligible voters) said they intend to boycott the elections for ideological reasons (i.e., they do not recognize the legitimacy of the Zionist regime).